Never before in Australia has there ever been a clearer path to beginning a motorcycle racing career than there is now with Motorcycling Australia’s Oceania Junior Cup. For an amazingly affordable price, junior road racers are able to receive a complete package that enables them to compete on a level playing field. This will be a very profitable way to make cash; front up at “Gate 2” morning on the 24/3/2019 with a ute / trailer full of items and turn them into real cash for the right parts. Potential to make hundreds of dollars cash as we will have the right buyers on the day, not people hunting for bric-a-brac. The VMCCWA will also have a “Large Trailer” in seller area, VMCCWA will accept parts donations at the end of the day if you have not sold everything and do not wish to bring parts back home. The VMCCWA will accept these donations for the club spare parts stores. RACING RETURNS TO BARBAGALLO WITH THE INTERCLUB Rd 1. Motorcycle racing has returned in earnest to Barbagallo Raceway Wanneroo on Sunday 10th March with the running of the first motorcycle race day since 2016. The Monday prior riders participated in a Training/ Tuning Day which was held in extreme conditions with temperatures in the low to mid 40’s. The addition of the ‘Chicane’ proved to be incident free and many riders said that “It adds something to the track”. As hopefully everyone can appreciate, the MCRCWA Executive is trying to be very diligent to ensure that 2019 is a year that see's the club's financial position improve. Australia’s most daring men and women on three wheels will be joining the ASBK for three rounds of the four-round sidecar season, beginning at Wakefield Park in NSW on 22-24 March. WA Sidecar Team of Jero Joyce and Corey Blackman will be contesting all 4 Australian Championship rounds this year. Come along and join the MWA Women's Committee for a fun night, meet some of our champions, female motorcycle riders, enthusiasts and volunteers, with an opportunity to network and share stories. Our calendar for 2019 is now available. Check it out here! Surface complete! Track lovers rejoice, the new surface is down and the 'Bus Stop' chicane for the bikes is in. a better time to become a member of the MCRCWA! What a night! The end of year wind-up in November was an absolutely brilliant cap to what was a disjointed, and longish season for our Club and competitors. For the latest regarding the return of Motorcycles to Barbagallo. The MCRCWA Executive comittee invited all 2018 MCRCWA members to an information evening associated with an update on Barbagallo Raceway. Also on the night the Executive received feedback / idea's for the 2019 season from club members. We would like to thank you all for your attendance and sharing your thoughts and look forward to seeing you and the next meeting. A Night of Celebration & Recognition-You're Invited! A Great night was had by all! Congratulations to all winners!! Meet our latest Life Member! As hopefully you are aware if you've seen our previous communications, since February a series of steps have been taken to try and see the return of MA sanctioned motorcycle activities to Barbagallo Raceway. Consent2Go Rd 3 - Run & Won! Looking for results from Round 3? GP Wholesale Team & PirelliMoto again for 2018! Huge thanks to Graeme and the GP Wholesale team, along with PirelliMotofor their continuing support of MCRCWA and the WA State Road Racing Championship. MCRCWA would like to show our appreciation and recognize Consent2Go who have come on board as the naming rights sponsor for the 2018 Consent2Go State Road Racing Championship. Trip to Phillip Island to Ride the best track in Oz! MCRCWA working hard in the background. A short update to our members. 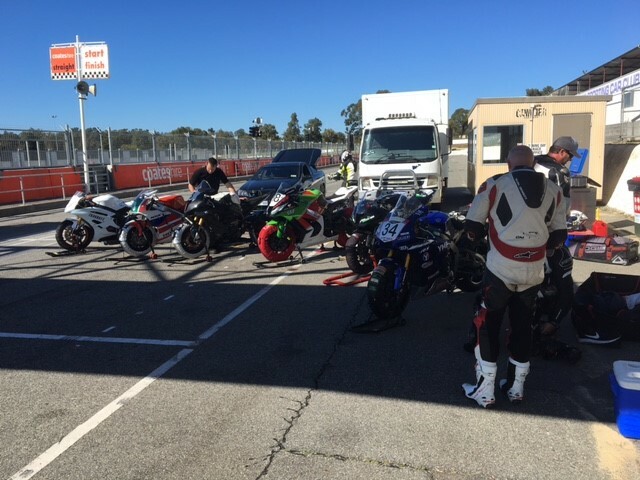 Yesterday afternoon, MCRC were invited to attend the MA track inspection of Barbagallo Raceway. We were there primarily to assist with the discussion surrounding the return of rider training to the track and to field any questions that the inspector may have with respect to the clubs proposal (refer to our past posts). On behalf of myself and the Executive team we hope you all had a great festive season. But, not too great that you won’t fit in your leathers. After all, you will be needing them this year as we are going racing, YAY!! Bryan Staring will contend aboard his Kawasaki Motors Australia backed Ninja ZX-10R in the 2018 Yamaha Motor Finance Australian Superbike Championship presented by Motul Pirelli (ASBK) under the Kawasaki BCperformance Racing Team banner. There have been some recent developments which we’d like to share which may help you to understand where things stand at Barbagallo and the resumption of motorcycling activities there. #MarshalWithMates Become a WSBK Volunteer Official! Motorcycling Australia (MA) would like to encourage prospective officials to apply for volunteer positions at the 2018 World Superbike Championship (WSBK) Australian Round at Phillip Island from 23-25 February. Have a chat with your mates to become an official. Like all awards it was a difficult choice for the Motorcycling Western Australia board, however from the nominations received from our clubs, the Official of the Year is a very deserving Paul Hinds. 2018 Island Classic Entries Open & Supp Regs Released! Motorcycling Australia (MA) and Phillip Island Grand Circuit are pleased to announce that Entries are open and Supp Regs available for the 2018 AMCN International Island Classic event to be held at Phillip Island Grand Prix Circuit Thursday 25th - Sunday 28th January 2018. The Motorcycling Australia App is now available. Download this app and you will always have your virtual licence with you. It is with much regret that we announce the cancellation of the Ridedays WA event that was to occur on the 23rd of June at Barbagallo. On the 29th of May the WA Sporting Car Club Board met and voted against running an event under the MA Phase 2 Track License due to lack of clarity associated with some of the conditions identified within the Phase 2 License. Further conversations between MA and the WASCC this afternoon indicate that with further clarification there may be the opportunity to move forward and plan future MCRCWA events at Barbagallo under the MA Phase 2 License. However this is going to take more time than is available to run the event of June the 23rd. I wish to recognize all the efforts that have been undertaken by the MCRCWA Executive team to try and get this event at Barbagallo Raceway, as well as the availability of the WASCC CEO and MA CEO to have conversations to try and get this off the ground. I will continue to make every effort to be involved in all discussions to see motorcycle events return to Barbagallo Raceway, as well continue to try and work towards seeing MCRCWA host racing events at the circuit. the MCRCWA Executive Committee has decided that it is unable to viably operate a Ridedays WA event under the conditions of the Phase 1 license at Barbagallo Raceway. associated with running an event under the new track licensing process, and look forward to seeing the Phase 2 Track license being issued soon. Thanks to the WASCC we still have days booked for 2018, that if the Phase 2 license allows us to viably operate events, will see us returning to Barbagallo Raceway to run Ridedays WA events. We hope that all parties (WASCC, MA / MWA) continue to communicate with the intent to see racing activities return to the metropolitan venue in the near future. On behalf of myself and the Executive team we hope you all had a great festive season. But, not too great that you won’t fit in your leathers. After all, you will be needing them this year as we are going racing, YAY!! So, make sure you get your Club membership and race licence squared away ASAP. For those of you that did not race in any other discipline please contact Rick Gill at MWA (9371 5333) to arrange a refund for your unused portion for 2017. You will still need to renew to race in 2018 though, so don’t get caught out. Yep, that’s right, we are holding a State Championship again in 2018 over 4 rounds A massive thank you to “Consent 2 Go” for once again being our naming rights sponsor, greatly appreciated and thanks for sticking by us. Tuning is on Feb 10th & 11th so please book online. Or, if you have last minute plans I’m sure we can take cash on the day. Round 1 is on Sunday 15th April, with tuning on the 14th so you can get your head into the right frame of mind for the weekend. We have a little break and then round 2 on 5th August, round 3 on 26th August and the final round being the 21st October. All 4 rounds will be held at the Collie Motorplex. So, whose name is going to be etched into the History books as Champion, and, new lap record holder of the new circuit… don’t let this opportunity pass you by. This is super exciting, and I can’t wait. Dates available to us are limited, but there is opportunity to get some additional track time with both Trakdayz and HCMC. Supplementary Regulations will be available shortly. With no racing in 2017 and very few RidedaysWA days the Club’s ability to sustain itself was challenged. The Exec team have been quite prudent and cut costs and expenditure where possible. This, coupled with financial support from MA has seen the Club get through 2017. And, with limited time at Collie in 2018 make no mistake about it, the tough time is not yet over. That said the Club is still strong and will continue to be. Thanks for your backing and support (and keeping the bar flowing, onya Pete). The Executive team (especially Tim Simmons) has been working on bringing the Club Constitution up to date. A Special General Meeting will be called in a couple of months for its adoption. It’s still a work in progress so please bear with us. The AGM will be held on 14th March at the Clubrooms in Wangara so please save the date. AGM Notices will be forwarded shortly. 2018 Membership is required to vote on the night, so please take the opportunity of the discount offer available for Memberships up until end of March (Full Member $180 and Associate Member just $50). During the maintenance shut of Barbagallo Raceway in January the WASCC have moved the wall back at turn 6 (basin) and have placed an arrester bed outside of turn 5 (skyline). These were two areas identified as posing a risk to riders, so that is great news. At the Ministers Meeting on the 30th January the main topic of discussion was Turn 3. Peter Doyle from MA provided WASCC appointed engineer Steve Brake a draft copy of MA’s updated guidelines. These are not yet locked away as they are currently under engineering review. For the Esses (turn 1 exit to turn 4 entry) Steve Brake spoke of the chicane proposal by Chris Hall not being feasible. The speeds through that section are still considered high by Steve despite some chicanes in place. MA’s Peter Doyle suggested an option at turn 3 would be to move the wall back 40 metres and install an arrester bed. And, if you include an air fence he sees that being suitable for 10+ years. This poses a risk to the WASCC and will greatly impact on spectator viewing area for the Supercars. As well as what was actually under the manmade hill itself. DSR have requested that WASCC get a geotechnical engineer report done on the spectator mound and DSR will arrange a contact for WASCC to use for this task. I put it to the meeting that the MCRCWA as a promoter can put together administrative controls to address the Turn 3 speed issue for Rider Training only (RidedaysWA & Trakdayz) to return. This was agreed in principle by all and as a viable option by MA & MWA. An action item from that is I have requested the desired speed data from Steve Brake to make our assessment. I will work with Trakdayz, MA & MWA to have this done ASAP. Obviously, any submission will need to be assessed and approved by MA & MWA prior to a permit being issued. Despite the possibility of Rider Training returning under administrative controls it goes without saying that the same cannot be done for racing. Don’t let this dampen your spirits, it’s actually good news and some progression made. All parties have some action items from the meeting and Minister Murray is damn sure he is going to be on everyone’s case to deliver (he was quite animated about this). I really do hope to see you all again racing this season. The Collie track does look pretty cool and it is completely different to Barbs, and I for one, see that as exciting. I can’t wait to be able to have a true State Championship across multiple venues. Take care of each other and ride safe. In an exciting announcement ahead of the Spokes.com.au presents Round 7 of the Yamaha Motor Finance Australian Superbike Championship (ASBK) at Phillip Island Grand Prix Circuit, ASBK will now feature four nail biting hours of Live free-to-air coverage on SBS. The work on returning motorcycle activity to Barbagallo Raceway has been progressing well. Motorcycling Australia (MA) is pleased to announce a new, streamlined process that will allow new and existing competition Officials to easily achieve Level 1 Operational Official accreditation, via the online Ridernet platform. Motorcycling Australia Member Special Offer. In 2016, the Department of Sport & Recreation (DSR) commissioned Mr Chris Hall to conduct a safety audit on Barbagallo Raceway. In his report, Mr Hall identified areas of risk concluding that motorcycle race activity at the Raceway presented an unacceptable risk. Firstly, thanks to those 140+ members that have continued to show support for our great club through these trying times. Your support is greatly appreciated. In 2017 Matt Price has jumped across from ASBK Supersport Championship into the heart of Europe for the Campeonato Italiano Velocità (CIV) National Trophy Superbike Championship. Onboard King Racing Teams Kawasaki ZX10r, which he tested at Mugello, Italy for 2 days at the end of the 2016 season. The Australian Sidecar Championship will again heat up at Morgan Park Raceway in Queensland, as competitors start to make their way from all corners of the country to compete for vital points this weekend. Motorcycling Australia (MA) recently caught up with rider Jero Joyce and passenger Corey Blackman F1 Sidecar Competitors. MCRCWA would like to inform our members and partners on the actual up-to-date position of the return to Barbagallo Raceway for bikes. Just a quick update, the MA inspection was carried out on Tuesday. This was the regular annual inspection. The inspection report will go to MA Monday as all the run-offs require calculation. We would expect MA to forward the licence and a report to WASCC sometime next week. A consultant will be on site early next week to conduct an independent risk analysis. The independent report will provide a more balanced view on risks at the venue outside of the MA licensing process. MWA are not involved with the consultancy but we understand that it will take into account the DSR report. Learn more skills, ride in a safe environment, and have the buzz of your life at the same time. Gain from the experience of Road Racing champions as they explain the theory and technique that has taken them to the top.